I wanted to make a platform for my dwarf hamsters because the one that came with their cage was kind of ugly. After looking at Nikkigrace’s Ikea Knuff hamster platform on Hamster Central, I was inspired to make my own DIY hamster platform. Here are the materials I used and instructions to make them. Note: I didn’t make any stairs because I forgot! Luckily, my dwarf hamsters were able to climb up the platform on their own. You could probably make stairs with popsicle sticks or paper tubes if you wanted to. You could also use these bendable fiddlesticks as makeshift stairs. I used only three legs and I should have used four! But it’s not wobbly so nevermind. You’ll need more or less depending on the platform base. You can also use shorter legs to make a lower platform. You should be able to find these materials easily in a hardware store. Amazon also carries wood dowels but I think they’re kind of pricey. If you’re in Singapore, I got all of these items from Daiso Sembawang — the corkboard is in the Stationery section and the rest are from the Crafts section. Glue the legs to the base and wait about 10 to 15 minutes for the glue to hold it together. I used three legs, but like I mentioned earlier, you could use more or less legs depending on the shape of your platform and how stable you want it to be. Flip the platform over and stick the wooden dowels along the edges of the base. Turn your platform as you stick the dowels so you can see clearly whether you’re sticking them in the correct position. Remember to leave an opening in the fence for your hamster to go on the platform. Put PVA glue on the outside of the fence between the dowels to make them less likely to fall out. You want to put glue on the bottom half only so that if your hamster chews on the fence, it doesn’t eat the glue too (although PVA glue is hamster-safe, it’s better if they don’t eat it). If you prefer not to make your own, there are plenty of hamster platforms available for purchase as well. A good one would be the Super Pet Woodland Getaway which is a platform and a house in one. 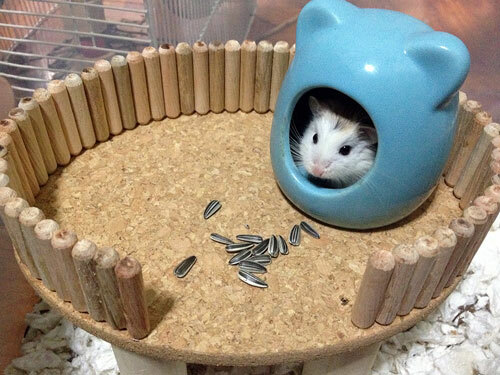 For under 10 bucks, you can get a medium-sized platform/house that has enough space for a hamster or two to nest in and climb on. Larger sizes are also available but they might be a little too big for a dwarf hamster to climb onto. This is made from wood that is safe for animals (our DIY platform is too!) so there’s no issue if your hamsters chew on it. No, glue is definitely not safe for hamsters to eat. No matter what type of glue, or Non-Toxic, the glue could get stuck in your hamster’s throat or the food pocket in its throat. That’s why they suggested to put it further down on the wooden dowels. I got a new hamster cage that is supposed to fit dwarf hamsters, but it doesn’t, so I was going to put cardboard the vertical tube it but it keeps falling apart. I love this idea! I was wondering, for the blue ceramic house, do you happen to know where or what website you bought it from? If so, how much was it? I have 2 male robo hamsters that live together. They don’t like being handled and are very shy. when I try to handle them they jump out and back into the box I use to keep them in when I clean there cage out. How can I get them used to me handling them without fuss. I really like the idea of the platform but don’t know if they would escape or if they would love it. please help with my situation. BTW i love this blog and as i’ve only had these hamsters for 5 months, this blog has really helped.